When The Velvet Underground & Nico album was released in March 1967 on Verve Records, with its Andy Warhol-designed, peel-off banana cover, it was far from a chart-topper. In fact, as the quote attributed to Brian Eno famously put it, the album may not have sold many copies, “but everyone who bought it formed a band.” And its reputation as a groundbreaker has only increased over the four-and-a-half decades since its original release. Universal Music / Polydor will celebrate the now-iconic album’s 45th anniversary on October 30 2012 with a multi-format, worldwide release on October 29th and 30th that includes stereo and mono versions remastered from the original tapes, previously unreleased recordings of the band’s rehearsals in Warhol’s Factory and the subsequent rare April 1966 Scepter Studios recordings captured on acetate which feature early, alternate versions of songs later issued on the album. A limited-edition, super deluxe six-CD box set will also feature a previously unavailable November ’66 live concert performed by the Velvets’ original, five-person lineup — Lou Reed, John Cale, Sterling Morrison, Moe Tucker and Nico — at the Valleydale Ballroom in Columbus, Ohio, and Nico’s Chelsea Girl, an album released in October 1967 (seven months after the Velvets’ disc) which featured all the members of the band as well as a teenage folksinger named Jackson Browne. It also includes an 88-page booklet with a new essay by band biographer Richie Unterberger. All remastering, tape transfers and digital assembly was overseen by veteran A&R producer Bill Levenson at the prestigious Sterling Sound Studios in New York; Levenson has been involved with previous Velvet Underground reissues for more than 30 years, working on VU and Another VU in the ’80s, the banana-covered box set in the ’90s and UMG’s first expanded, deluxe edition of The Velvet Underground & Nico in 2002. This six-CD set captures the Velvets in a crucial period in their development, covering the band’s Factory rehearsals in January ’66, the original Scepter recording sessions that April, then a live show in November, leading up to the March ’67 release, almost a year after the album was finished. Nico’s Chelsea Girl, which came out seven months later in October, completes the set’s almost two-year arc, chronicling the band both before and directly after its historic debut. The super deluxe set allows fans to compare the mono and stereo versions of the album. Longtime Velvets aficionados have touted the mono mix because of its lo-fi quality, with the music coming off even tougher as a result of its compression. The Velvet Underground & Nico album has achieved many honours since its release: The Observer placed it number 1 in 50 Albums that Changed the World; Uncut placed it at number 1 of 100 Greatest Debut Albums; it was placed in the top 10 of Mojo's 100 Greatest Albums Ever Made and it continues to consistently top UK polls. In the US, the earned the original band a slot in the Rock and Roll Hall of Fame; Rolling Stone placed it at number 13 on the list of the 500 Greatest Albums of All Time in November 2003, dubbing it “the most prophetic rock album ever made”; Spin Magazine placed it atop its list of the Top 15 Most Influential Albums of All Time that same year and the album is one of 225 recordings in the prestigious Library of Congress National Recording Registry. In Czechoslovakia, the band gave its name to the Velvet Revolution, which overthrew the Communist regime in that country. Globally, the album is seen just like Sgt. Pepper’s and Pet Sounds, as a seminal, influential high-water mark in rock music history. Universal will release the album worldwide simultaneously in six different physical and digital versions. 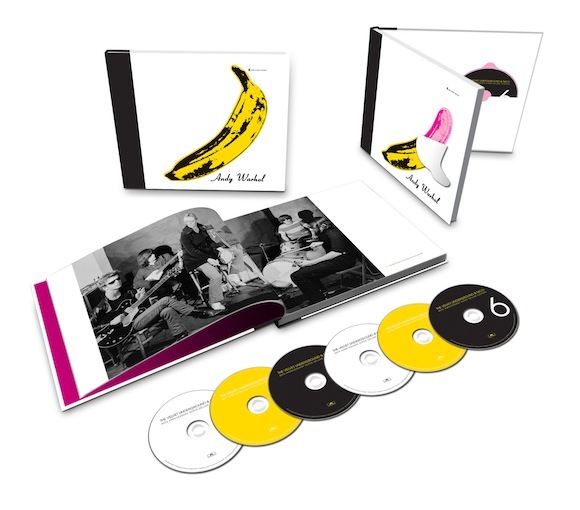 Aside from the Super Deluxe edition, The Velvet Underground & Nico will be available in a brand-new two-CD Deluxe Edition which includes a stereo version of the album along with a separate disc of the Factory rehearsals and Scepter Studios sessions. There will also be a digital exclusive and a one-CD original stereo album remaster in both physical and digital form (alongside a remastered vinyl edition). The deluxe edition and digital reissue of The Velvet Underground & Nico is not only for hard-core fans, but for anyone who wishes to trace the two-year development of a world-class band in the process of creating one of the greatest albums in rock history through rare and previously unreleased recordings.